Eighteen states and the District of Columbia filed a friend-of-the-court brief Friday in Washington to bolster plaintiffs challenging a new U.S. policy that denies asylum to those claiming to be victims of gang or domestic violence. The policy was previewed in early June by Attorney General Jeff Sessions, who wrote in a legal opinion that asylum cannot be a "redress for all misfortune." 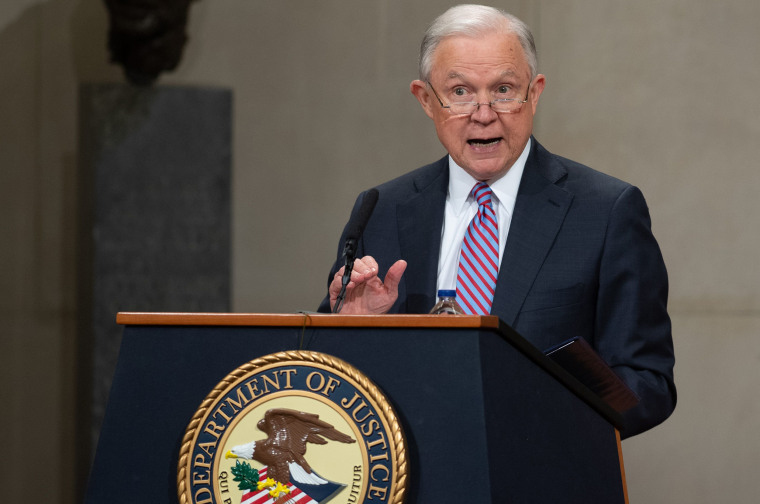 "The mere fact that a country may have problems effectively policing certain crimes—such as domestic violence or gang violence—or that certain populations are more likely to be victims of crime cannot itself establish an asylum claim," he wrote. It was widely seen as another element of the Trump administration's crackdown on south-of-the-border immigration. On Aug. 7 the ACLU filed a lawsuit, known as Grace v. Sessions, against the policy in federal court. The plaintiff, whose full name was not revealed, said she was abused by her partner "and his violent gang member sons." But she was denied asylum on July 20 and detained in Texas. On Friday, Attorney General Karl A. Racine of the District of Columbia said in a statement that the new policy "ignores decades of state, federal, and international law." The friend-of-the-court filing states, "Federal law requires that all asylum claims be adjudicated on the particular facts and circumstances of the claim, and such a bar violates that principle." The brief says women and children are disproportionately affected by the attorney general's new guidelines because they're far more likely to suffer from domestic abuse. "While state, federal and international policies and laws have recognized this harm, the new U.S. Department of Justice policy unlawfully ignores this fact," Racine said in the statement. The brief argues that federal courts have long recognized the need for asylum among migrants who have been abused by partners or victimized by gangs—a cohort sometimes associated with Central Americans seeking entry. The filing cited data indicating that immigrants in general are good for state economies because they're more likely to be entrepreneurs and because they "supply necessary labor." In other words, the states are claiming in the brief that Sessions' new policy is hurting their bottom line and "threatens the economic and social growth of states and localities all across the country."